Are you new to the world of wine? Unsure what wines are considered to be “dry?” Read on! 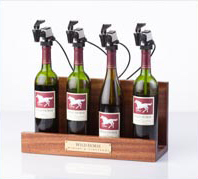 Host your own wine tasting event with a WineKeeper 4-Bottle Showcase preservation system. Keep in mind that some of these wines may taste “fruity,” but do not confuse a wine’s fruitiness with its “sweetness.” Fruit flavors often naturally balance a wine’s absence of sugar. Also, don’t confuse a wine’s tannins with how dry it is. Tannins can give sweet wines a “drier mouth feel,” but their abundance does not make a wine dry. Remember: it’s all about the sugar! Curious about how these wines taste? Why not buy a bottle of each and host a few mini tastings, yourself? You can easily save any leftover wine with the WineKeeper 4-Bottle Showcase preservation system. Cheers! If you’ve read our recent post, If You’re Going to Drink, Choose Red!, you may be wondering how to effectively increase your red wine consumption by substituting it for white. The good news is that there’s a red wine alternative to just about every “traditional” white-wine dish! Though it may take you (and some of your guests) a little time to get out of the mindset that certain foods must always be enjoyed with either whites or reds, specifically, the rewards are more red wine consumption at your table and (quite often) more interesting pairings! Let’s start with fish! When it comes to the creatures of the sea, white wine has been given dominion. However, there are excellent reds that will not overpower your fine, flaky fillets. Try a baked or grilled fish dish with a bottle of Cabernet Franc or a nice Cote du Rhone. These red wines, because of their low acidity, blend quite well with almost all of your typical fish dishes. Next comes pasta! If you’re eating pasta with tomato sauce, experiment with almost any red! Reds, in general, are fantastic with tomato sauces (especially those with meatballs!) If your pasta is covered with a tantalizing cheese sauce, consider pairing your plate with a light Burgundy or Merlot. These two wines are excellent compliments to cheese sauces of all kinds, even ones that incorporate a bit of spice! Lastly, we come to chicken! Like the numerous reds that go well with tomato sauce, I urge you to experiment! For a few starters, consider pairing your bird with a bottle of Pinot Noir, Chianti, Barolo, or (a personal favorite) Beaujolais. Beaujolais works especially well with recipes involving cornish game hens sprinkled with rosemary, as well as barbecued chicken. Have fun, be adventurous, and keep track of the reds you find work best with your favorite “white wine” foods. Enjoy! It’s still winter, but that doesn’t mean it’s not the season for spicy food. In fact, a good meal filled with spicy delights might be just the thing to warm you up! Are you eyeing that jalapeño? Are red, hot chili peppers calling your name? Here are some wines that are sure to complement your spicy food’s zestiness! If your dish contains mild, flavor-rich peppers (like chili peppers or cherry peppers), consider having a glass of Malbec on hand to soften the burn. If Malbecs seem too “big” for you, perhaps a fruit-flavored Pinot Noir will be an acceptable counterpoint to your cuisine? And if you’re a diehard white wine drinker, never fear; dry Rieslings will also soothe your taste buds while simultaneously pairing well with your meal. If your dish is so hot that it could be labeled “nuclear,” consider pairing it with a wine that has a lower alcohol content and is also on the sweeter side. A German Riesling with low a low level of alcohol, such as Spätlese, is an excellent choice (as is an Alsatian Gewurztraminer). Don’t be afraid to pair your spicy, winter cuisine with a bottle of white or red listed above. You’ll be surprised how a decent, appropriate bottle can compliment even the hottest of peppers. Cheers! Wine and Chocolate: What Really Works? Because white chocolate is more subtle than milk or dark, it pairs very well with Sherry and Moscato d’Asti. Though some people like to pair white chocolate with red or white Zinfandel, the counterpoint of flavors can sometimes provide a dissatisfying contrast (if not “sampled” for approval beforehand.) Our advice: play it safe and stay away from Zinfandel unless you know your mate has enjoyed such a combination before! Milk chocolate goes well with Pinot Noir, several Rieslings, and Muscat (one of our favorites!) Ruby–not Tawney–Port is almost always a perfect fit for milk chocolate, so we recommend serving this dessert wine when in doubt. Dark chocolate craves to be paired with wines that also display hints of chocolate. A good red Zinfandel or Cabernet Sauvignon is an excellent choice for a box of dark chocolates. Merlot and Tawney Port also pair exceptionally well with dark chocolate. We hope these suggestions aid you on your quest to find the “perfect” wine to accompany the chocolate delights you plan to present your lover. (Remember, there’s no harm in buying a few extra bottles of wine so you can sample some combinations yourself before February 14th, just to be sure!) Cheers! Since some wines given at Christmas are opened the same day, it’s good to include a couple bottles that can pair with various holiday dishes like roast duck, turkey, beef, mashed potatoes, stuffing, various pies, chocolates, peppermints, fruitcake, prune cookies… In other words, be sure to include a couple wines like Pinot Noir, Chardonnay, and Sauvignon Blanc that will not clash wildly with the barrage of disparate food items they may be stuck accompanying! Because some odd dishes do appear during the holiday season, perhaps it’s not too off the mark to include a bottle or two of a novelty wine? For example, consider cranberry wine. This sweet, curious wine will certainly generate conversation. Like comparing apples to pears, it can’t be adequately described with the same terms used for grapes. This wine goes well with poultry, fried chicken, and chocolate among other foods, and can also be sipped by itself. On the more potent side, you may want to consider a plum wine. This wine ranges from tart to sweet, and can nicely complement a variety of pies. If you’re unsure about what wines to include in your gift basket, you may want to include a few reds and a few whites. One example of a nice variety of wines is as follows: Pinot Noir, Cabernet Sauvignon, Red Zinfandel, Sauvignon Blanc, Chardonnay, and Gewürztraminer. You could also substitute a bottle of port for one of the reds, or gift a bottle of port with two whites. No matter what you eventually select, rest assured that someone will enjoy your gift! 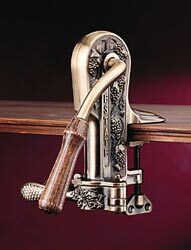 To encourage them to enjoy your gift right away, consider including in your gift basket a Rogar Estate Bronze Wine Bottle Opener. Cheers, and Happy Holidays! Shopping for gifts at the last minute, again? Does what to get for a certain loved one have you stumped? If you continue to suffer from the daunting task of gift selection, here’s a gift that is always appreciated: wine! What is more, shopping for wine is much easier than sifting through racks of ties, perusing packages of festive socks, or combing the entire hardware section of Sears. And unlike jewelry that may not see the light of day once fashions change, or knickknacks that may have just a two-week shelf life, wine will always be popular and appreciated. You need not break the bank when purchasing wine (there are good bottles in every price range), and its affordability allows you to easily put together decent gift baskets for less than $50. Single bottles can even be given as gifts; special “artistic” bottles created by vineyard artists make excellent showpieces after they have been enjoyed, and most retailers offer gift bags, boxes, and wrapping services so your present will look extraordinarily presentable! Because gifted wines often get opened around a broad array of holiday foods, at least one wine to include in a gift basket is a Pinot Noir since it pairs adequately with most foods. Equally good is a sparkling wine, which is always associated with festive times. For variety’s sake, you may want to gift one of each– white, red, and sparkling wine –so that your recipient has options to choose from. Also, you may want to consider including a rosé; though this wine is often associated with summertime, it adds a breath of fresh air to winter dinners. When serving wine at your holiday dinner, make sure you use proper wine glasses, and keep your wine bottles at the proper serving temperature. It is especially important to make sure your sparkling wines are adequately chilled. (No one likes warm Champagne!) Whites should be chilled properly, too, but most reds can be served at cellar temperature. To be sure your wine reaches its ideal serving temperature, consider using a Le Cache European Country 1400 wine cabinet, or a Vintage Series 2 door single-deep credenza in your dining room. No matter the occasion, the gift of wine is one that will always be welcomed. Happy Holidays! While inferior wines aged in oak are abundant, so are several of the world’s most prized, quality wines; these gems possess an intriguing degree of complexity (plus have a fantastic shelf life) because of the oak aging process. Wines that benefit the most from oak aging are Pinot Noir, Cabernet Sauvignon, Syrah, and Chardonnay. When discussing such wines aged in oak, words like leather, cedar, mushroom, and vanilla may be familiar to you. These flavors have been perfected over the years by fantastic winemakers who still produce oaked wines. (Do a little field research, i.e. tasting; they are out there!) You can usually tell a quality, oak-aged wine with ease: enhanced by the oak, it tends to be much smoother, more rich, softer on the tongue, and better balanced than a non-oaked wine. Of course, you will taste some oaked wines that miss the mark entirely, but remember that in these instances the reason for the wine’s failure was not the oak, but rather the initial grapes. Think about the old computer programming phrase “garbage in, garbage out,” (abbreviated as GIGO). With computer programming, as well as winemaking, the final product is only as good as the quality of the initial input, or grapes, in our case! For more information about the science of aging wine, visit the Vintage Cellars Wine Storage Education Center. If you’re planning to host a fancy Thanksgiving, why not pull all the stops? Instead of serving one wine with the meal, liven things up by serving several in graded succession. For example, start with an apéritif either on its own, or with some light appetizers. Muscat is an excellent choice, and helps prepare the palate for courses yet to come. If your main course consists of turkey, consider serving a light white to accompany the subtle flavors of this bird. Dry whites are especially nice, but for guests with sweeter tastes consider pairing the bird with a sweet Riesling. To keep family and friends happy, offer them these wine options, or (better yet) let them sample each. As a third choice, a nice bottle of Pinot Noir will always be a winner. For dessert, pair your pie with a tasty glass of port. For pies on the more tart side, consider a tawny port. For sweeter pies, ruby port is a nice match. This Thanksgiving, serving a variety of wines throughout your meal will help to make your Thanksgiving feast a classy wine adventure to remember! In fact, this holiday may even be the perfect occasion to use your new Riedel Riesling Grand Cru wine glasses, or to pass around a set of lovely Vintage Port glasses… Just food for thought! Happy Thanksgiving! It may be September, but it’s not too early to start planning your trip to the 2012 Millésime Bio, Europe’s largest and most impressive organic wine conference that takes place yearly in Montpellier, France. Among the winning wines from 2011 was a curious 2009 Pinot Noir from Frey Vineyards. (It won a bronze medal.) What is most interesting is that this wine hails from America’s first organic winery. That’s right… it’s an organic wine from a “recent” American company founded in 1980! With no added sulfites, this wine came in 3rd at a French wine competition. Given that the conference featured over 500 organic winemakers, this is quite impressive. So of course we had to try it! With flavors of strawberry, raspberry, pomegranate, and a hint of unsweetened jam, this very smooth wine is sure to make your tastebuds happy. It’s a great fall wine, perfect for accompanying chicken, duck, goose, and even turkey meals. (If pairing with turkey, for best results place a bit of sausage alongside the turkey meat; the sausage helps bring out the wine’s unique French oak flavor.) This 2009 Pinot Noir also pairs well with flavor-rich fishes like salmon or red snapper. Try a glass, and see what the French critics found so delightful! You may be surprised an organic wine can taste this good! This relatively inexpensive Pinot Noir is quite a treat! Beautiful garnet in color, its nose consists of violet, iris, strawberries, and black cherries. Its velvet-like texture is soothing to the tongue, and its body is solid. For fans of sweeter Pinot Noirs, the Block Nine 2009 is a good find; the typical earthiness that turns people off from many Pinots is very subdued in this one. Flavors of semi-sweet black cherries delight the tongue, and the spicy finish is very satisfying. Though not an extremely complex wine, it is incredibly well-balanced (which is quite nice, considering its low price). Because of its well-integrated taste, plus its balanced tannins and acidity, this is a wine that really “works.” It’s a sure winner, and is guaranteed to please most wine and non-wine drinkers, alike. Consider storing a few bottles in a 23-Bottle Wine Grotto Wine Cellar, or an elegant Vinotheque Boxed Up-3 Door Double Deep Credenza, to pull out for unexpected company. No matter the occasion, this wine will help make it memorable. Cheers!